Dimensions 813'4" by 108'3" by 30'1"
Richelieu was designed in response to Mussolini's declaration in 1934 that Italy would construct two battleships with 15" guns. The design was sound, with two quadruple turrets to reduce the length of the armored citadel and allow good protection (particulary horizontal protection) within the treaty displacement. The 6" guns in the original design proved useless as antiaircraft weapons and the number was reduced to allow for a 3.9" antiaircraft battery. 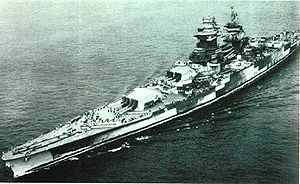 Four ships of the class were authorized, but aside from Richelieu, only Jean Bart could be launched before the fall of France. She was moved to Casablanca, where there were no facilities for her completion, and where she was badly damaged when she put up resistance to Operation TORCH. She was completed postwar, in 1955.